Players asking to be left out of Scotland squads are showing "petulance" towards Alex McLeish and should never be picked again, believes Craig Brown. "I see one or two lads say they don't want to play," Brown told BBC Scotland. "From the outside it looks as though there is a bit of petulance there. They are not first choice on every occasion. "If a player says that to you, then you don't want anything to do with them. "Obviously the player wouldn't have his heart in it if he was to play for you. I think it would be understandable if you just ignore them." 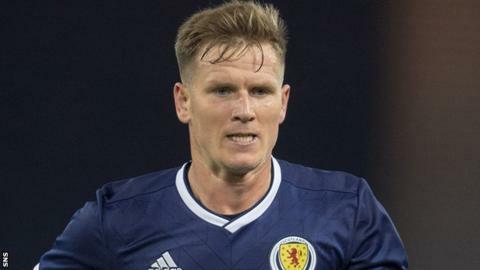 McLeish said Ritchie's reasons for asking not to be considered for the games against Albania and Israel were "private" but "he has not retired". "It is not something for me to discuss," McLeish said. "He had injury issues as well, and again, there is management of his injuries. "You don't know everyone's private life so you have to respect that." Ritchie has started Newcastle's last seven games, while Snodgrass, who McLeish said is "managing a kind of ankle knock that is ongoing", has featured in all of West Ham's games this season. McArthur announced his international retirement to "prolong his club career" with Crystal Palace, while Celtic striker Griffiths caused a stir last month when he pulled out of the last Scotland squad to "focus on his fitness". "From the outside they look like they are in the huff because they are not a first-choice selection," added Brown, Scotland's longest-serving manager who took them to their last appearance in a major finals, the 1998 World Cup. "We'll find out whether they are picked again. I said publicly I wasn't going to pick a player and I never did pick him - and he was captain of Rangers at the time. "You make a decision that you feel is correct at the time and you have got to stick to it. You can't be indecisive as as the manager of the Scotland national team." Brown says only one player in his eight-year tenure in the job asked not to be considered - former Celtic midfielder Paul Lambert. "It was a very respectful decision Paul made," he added. "He wanted to further his time with Celtic - a bit like Scott Brown is doing now. "Paul felt the rest he would get on international weekends would help him to be fitter and play better for his club. So I respected Paul's decision."